January 17, 2007, "Comb Ridge & Beyond: Seeking the Anasazi"
November 18, 2009, "Everett Ruess and the Canyon Country: A 75-year old disappearance remains a mystery". 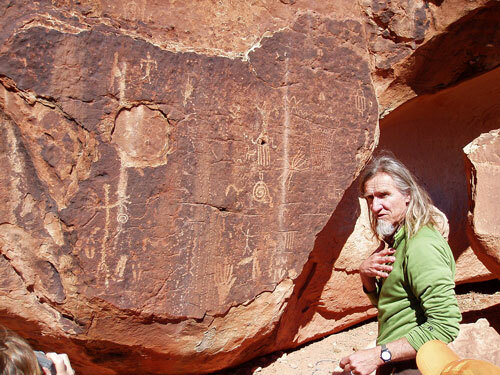 Vaughn Hadenfeldt has been guiding in the Four Corners region for over 25 years, and is the owner and guide of Far Out Expeditions (FOE) in Bluff, Utah. While owning and operating a mountaineering store on the western slope of Colorado, he traveled with a friend to the canyon country in southeast Utah and was captivated by the incredible archaeological treasures of the region. Vaughn made use of his studies in anthropology and his passion for hiking in the backcountry to create a guide business that specializes in sharing his knowledge of the cultural and natural histories of the area while providing a fun and fascinating backcountry experience for his guests. Named as one of the Best Guides in the World by National Geographic Adventure Magazine in 2009, he is widely renowned and has been written about in books and magazines published around the world. Vaughn and his wife have lived in Bluff for 13 years. To quote David Roberts' "In Search of the Old Ones", "Nuances of canyonscape, vestigial Anasazi ruins, all-but-vanished panels of prehistoric rock art, mountain lion tracks, inscriptions scratched by cowboys with bullet lead on sandstone walls a century ago – all these prodigies of the outback Vaughn manages to discover in places where I would have passed them blithely and ignorantly by." Many LAM members have enjoyed Vaughn's wonderful guided field trips during Bill Priedhorsky'spopular Canyon Country Day Trips to the Bluff area.